Watches are men’s daily accessories and if the watch has additional features like multi-band six atomic timekeeping, three sensors, strong solar battery and is shock and mud resistant, do you think you can sit at home and not buy this watch. 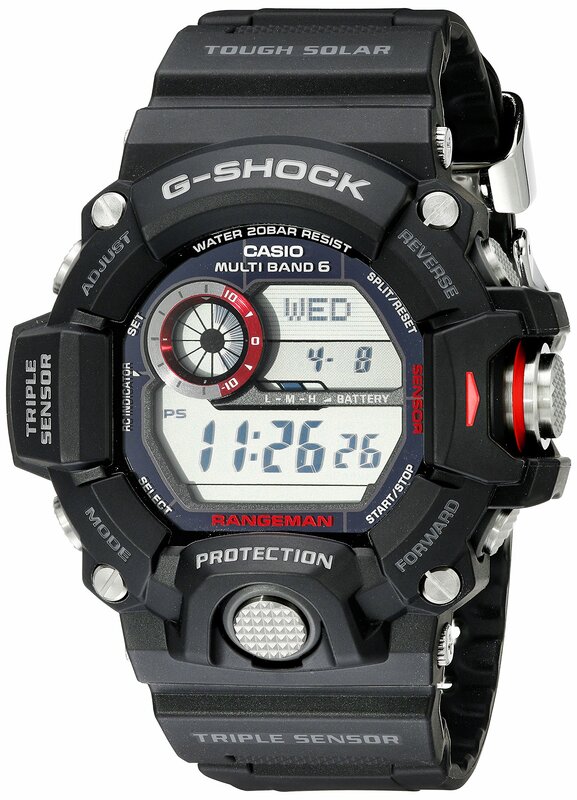 It provides durable, waterproof men’s digital watches for every activity. Casio GW 9400 1CR is the ultimate tough watch. It was made by a developer who wanted to make a watch that never breaks. The designer team tried this watch with free-fall endurance from 10-meter, 660 feet water resistance and with a 10-year battery life. Casio GW 9400 1CR Watch has the triple sensor which includes altimeter/barometer, thermometer, and compass. The altimeter can measure altitudes based on changes in atmospheric pressure and also sea level. This will mainly help during hiking and climb as you can get more accurate reading. The barometer can forecast the weather based on the atmospheric pressure. Weather forecasting is pretty much important during hiking, camping and other adventures where the weather change is unpredictable. The barometer graph works well when you are stationary and gradually change altitude. The compass and thermometer sensors have their general purpose in the watch that again helps during your adventures and helps reduce problems to reach your destination and are best for sensor operations. And the best part is it can read all the measurements automatically. As the name already screams the battery is charged using solar power. The tough solar battery has an approximately battery life of 7 months on full recharge (without further exposure to light). There is a solar panel in the face of the battery that helps to recharge the battery. It also has a solar rechargeable battery, battery level indicator, and power saving as well. The Casio GW 9400 1CR digital watches saves you the time to replace the battery over and over or charge them. The casio GW 9400 1CR digital watch self-adjusts time by receiving time collaboration signals and corrects the time. The multi-band 6 is a radio controlled system that helps receive time calibration signals. It helps to keep time in check including sunrise and sunset date, time stamp, four alarms,1/10 second stopwatch, countdown timer, etc. This feature is best for rangers, rescue crews, and anyone else whose profession or activities demand unfailing reliability. When you wear a watch daily, it is bound to be abused, so a watch that is resistant to both shock and mud are a must for your closet. The case and buttons are sealed to prevent mud, dirt, and dust from getting into the watch -200M Water Resistant. So yes you can roll all around in the mud wearing the watch and guess what it will be perfectly fine. Also, this watch is perfect for Army use as well. The digital display of these watch has full auto LED (super illuminators). The backlight and afterglow give the watch a better display as a whole. Waterproof –so yes you can have a bath wearing it too!! Q: Does it have a 24 hour time? A: Yes, it has, and this may be critical to many people. Q: Is the band made of resin or carbon? A: It is straight resin. Q: What is the color of the LED? A: It’s plain white but has a slightly bluish tint. Q: Will the atomic clock feature work in Central America (Costa Rica)? So if you are looking for a watch that can be abused a lot but still it stays with you and also suitable for military work, then I guess that the Casio GW 9400 1CR Digital Watch is pretty much the thing you are looking for. You may think that it is a bit expensive, but you have to see the features are pretty much everything that you want and which are helpful in you adventures ahead. So yes you should probably take a look at the watch and may consider keeping it in your closet.